Though most of Ubisoft’s conference was uniquely its own, there was one reveal that gave me a “Ghosts of Christmas Past” vibe. That game was Shape Up. What do I mean by that? Namely, it reminded me a LOT of previous demos from yesteryear by Nintendo and the Wii. Which is especially strange, given Ubisoft’s seeming break with Nintendo. Regardless, it was a truly interesting and entertaining looking game, only further accentuated by their brilliant and lovely host, Aisha Tyler. 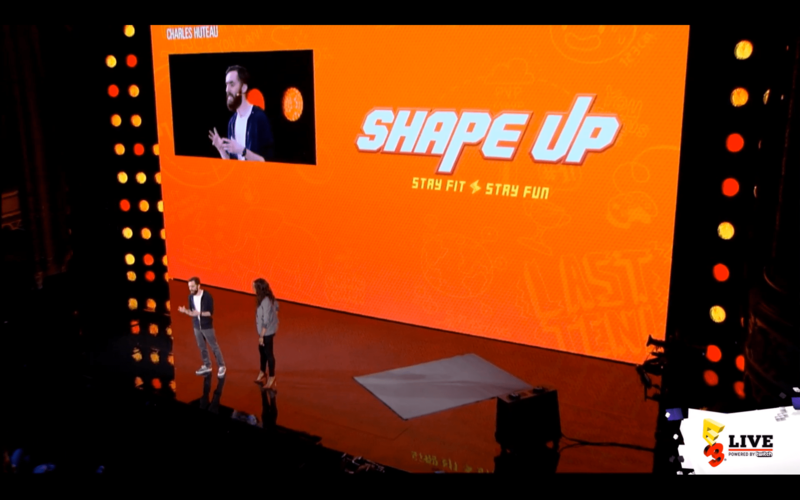 Shape Up, quite simply, looks to make exercise fun for owners of XBox1. It sets you against animated challenges to work out to, such as this demo above of grooving against the tune of Eye of the Tiger DDR style. Players exercise against their own avatars, allowing for personalization and competitive flair. It all seems to stem from the owner’s desire to beat their own high scores, essentially tricking them into losing weight. Which is kind of awesome. After the first demo, Ubisoft invited two gentlemen to compete doing push ups against each other. If that all sounds a bit goofy and silly, that’s cause it was. But if Nintendo proved anything with the Wii, it’s that players can enjoy games with a productive objective. It remains to be seen whether or not Shape Up will succeed in just that for Microsoft and Ubisoft.